Perception is one of the most unique horror premises we’ve had in some time. The concept involves a woman exploring a house that she’s been seeing in her nightmares, but the twist is this: she’s blind. How does one make a game about someone who can’t see? 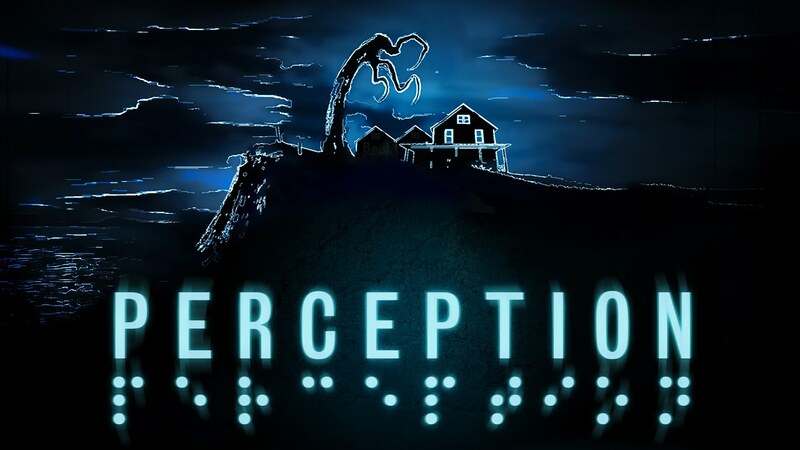 Perception uses a creative rendition of echolocation to help you and the main character see. It’s not a superpower either, it’s a tactic that real people use to better understand their surroundings. So, does Perception manage to terrify you with its unique mechanic, or does it leave you looking for more? Read on to find out! Perception takes us to Echo Bluff, an abandoned estate in Gloucester, MA. This home doesn’t seem to scary from the outside, but Cassie has seen it in her dreams for some time. She arrives in person to try and unravel the mystery. Despite being blind, Cassie is a very resourceful person who has developed an ability not unlike echolocation where she can “see” her surroundings using sound. While people who are blind actually use sound to help them get around, Perception takes this to another level for the sake of the game and portrays an artistic representation of how it could be interpreted visually. More on this soon. Back to story, Perception uses a couple of different plot devices to convey the twists and turns in its narrative. For starters, you’ll see ghostly apparitions appear and play out certain events before your eyes. In addition, certain objects can be picked up and trigger a memory of sorts attached to it. These are done in the form of narration that echoes around you. Cassie also has a few apps on her phone to help her navigate the world. One is Delphi, which is a text-to-speech app that allows her to take photos of items with her smartphone and have a digital voice read the text back to her out loud. The other app is called Friendly Eyes, which allows Cassie to take pictures of things in the environment and then have a live person describe the photo to her. This is used to add more detail to scenes and give the player information they couldn’t have without being to physically see it. Finally, Cassie herself will chime in from time-to-time. Between all of these things, there’s a lot of story to be found in Perception and the variety of ways it’s delivered helps keep things interesting. Of course, I won’t say much about the story, as it is a major focus of the game. Essentially, there’s some sort of dark Presence in the house, and Cassie’s journey will take her through the house in a variety of time periods in her search for answers about the darkness that haunts and home, and why she is seemingly tied to it through her dreams. I really liked the story in Perception. Only one chapter didn’t work for me, and it was mostly a gameplay issue, but the story in the chapter seemed to be heading towards a dark subject that turned out to be more of a red herring than anything. I wasn’t sure why the game would insinuate that, when the truth was almost entirely opposite. It seemed like it was there for shock value. Despite this hiccup in the story, the characters and revelations in Perception were all very interesting. Ultimately, when the credits rolled, I felt like I had finished a well-made meal. Nothing about the story was wildly different (beyond the premise), but it was all executed very well and left me satisfied. Could it have done more? Sure, and there could have been more to the lore and ultimate reveals, but everything that’s here is absolutely worth your time, especially if you like supernatural horror. Perception’s gameplay, at the core level, is similar to most other survival horror games of late. You explore, solve some basic puzzles, and use designated hiding spots when The Presence decides to come looking for you. All of this would be unremarkable if it weren’t for the game’s hook. Since Cassie cannot see, the game employs an echolocation mechanic where sound reveals the world around you. Sounds like rushing wind, crackling radios, and even the road of a fire can help you see an area clearly. Even your footsteps send out blue waves of sound that temporarily reveal the immediate area. Cassie also has a walking stick that can be tapped into the ground or object with the R2 button. This gives you a nice pulse of sound that rushes out from the point of impact, revealing the area for a brief time. Absolute silence brings absolute darkness, and making too much noise will attract the Presence to you. The game warns you of this on several occasions, and while The Presence didn’t seem unscripted like, say, the Xenomorph in Alien: Isolation, it did have an unpredictable way of showing up, especially when I was moving too fast or using my walking stick excessively. The constant terror of this deadly forced, combined with the game’s thick and daunting atmosphere and occasional jump scares had my on edge the entire time. Not being able to see most certainly added to the tension and made the game much scarier than it would have been if you could see everything, but I wouldn’t called Perception “terrifying” from a horror perspective. The aforementioned chapter that had some odd story decisions also has some annoying gameplay choices as well. I point out this one specific chapter because all of the others had a general flow to them that I liked, and this one comes in and tries to change things up. Again, without spoiling anything, let’s just say that the difficulty spikes and you’re forced to dodge threats that can put you down without much effort, especially if you don’t know where you’re going. Major threats that depend on you to reach a specific location or stealth your way past them are far more frustrating in a game where you can’t see everything. I had some trouble with this chapter as a result, and getting lost (which did happen from time-to-time) was far more annoying in a level where death came swiftly and often. While this one chapter did spoil some of the experience for me, it by no means ruined it. I still enjoyed my time with Perception’s gameplay and I think its mechanics were a really interesting twist on the horror genre. For the most part, they’re really cool, but certain scenarios become unnecessarily difficult as a result. Despite Cassie’s blindness, there are some really artistic visuals in Perception. The way sound flows across surfaces and illuminates them like a moving light is something I don’t think I’ve ever seen before in a game. The murky blue color that the developers chose is also easy on the eyes, so I didn’t mind seeing the whole game through that lens. Little touches like the way wind sweeps across the exterior of the house, or how the crackle of radios creates a kind of pulse in the visuals all make the experience unique from a visuals perspective. Of course, with so much dependence on sound, Perception needs to bring the heat in this department and here we have another high point. Sound effects like footsteps, the tapping of Cassie’s walking stick, and the creak of doors all have a weight to them and a beautiful echo that rattles off the house’s walls. Again, it’s the little details. Cassie’s stick, for example, makes different sounds based on the material that it’s hitting. Wood floor have a low and thick sound, while hitting stone and tile creates a shrill clicking sound. In the voice acting department, things as mostly good. Cassie herself is very well done, but her tone can sometimes clash with the situation. She’ll make observations and reactions that work, but then she’ll crack a joke when it seems like she should be freaking out. You could chalk this up to a defense mechanism, but I always have trouble with characters in horror games make light of a situation. That being said, while The Presence doesn’t speak much, when it does, it’s absolutely terrifying. The inhuman cackle of its voice sent chills down my spine every time. Honestly, I wish it had spoken more. In the end, we have a game on our hands that combines elements we’ve seen before, with new mechanics that are not only interesting and unique, but really creative in their implementation. Despite a rough chapter, and some standard horror tropes, I really enjoyed my time with Perception. It’s mechanics alone are something I won’t forget about any time soon. Cassie may not be able to see, but that doesn’t mean that Perception lacks vision. It’s that vision that manifests into a really interesting, if slightly flawed, horror experience. If you’re a horror fan looking for something new and different, it’s time to open your eyes to Perception.